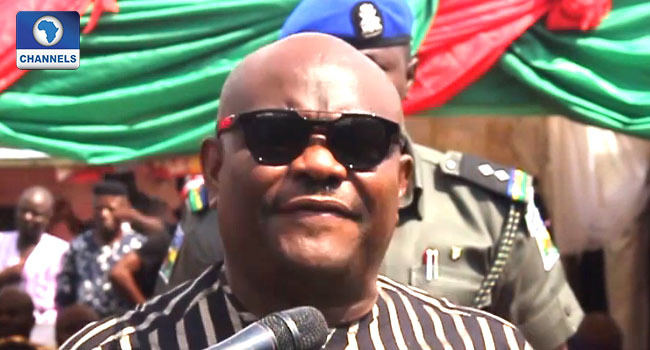 The Rivers State Governor, Nyesom Wike, has accused the Police of sabotaging the bye-election that took place in the state on Saturday. In a broadcast on Sunday, the governor described the exercise which he claimed was disrupted by the police and some thugs sent by the All Progressives Congress (APC), as a declaration of war on the people. He said, “The consistent sabotage of the electoral process by the Police amounts to a declaration of war against the people of Rivers State and their solemn rights to freely and fairly choose their leaders and representatives”. Governor Wike said despite assurances from the Rivers State Commissioner of Police during the last State Security Council meeting that the police will remain neutral and act professionally, “the police on Saturday August 18, 2018, joined forces with APC thugs to disrupt elections”. “As we had feared, the Police failed us completely once again and negated all that they promised. “Instead of providing security for voters and INEC officials the Police brazenly colluded with political thugs of the All Progressives Congress (APC) to subvert the democratic process and denied the people of Port Harcourt Constituency (iii) their rights to free, fair and credible elections. “Confirmed reports from the field indicated that INEC promptly and rightly distributed elections materials to all the polling units within a recorded time. “However, while voting was underway, armed thugs from the APC led by the State’s factional Chairman, Mr Flag Ojukaye Amachree moved freely from one polling unit to the other, violently assaulted voters and INEC officials and carted away election materials, including smart card readers and ballot boxes,” he said. The governor also alleged that the disruption of the Port Harcourt State Constituency (iii) Bye-Election was not the first time the Police would be indicted for unconstitutional anti-democratic action during an election in the state. He also questioned the ability of the police to guarantee security during the 2019 elections. Wike, however, thanked the people of Port Harcourt State Constituency (iii) for their peaceful conduct despite the electoral misconduct. According to him, their actions have exposed the true enemies of the state. He, therefore, asked them not to be intimidated and choose a leadership that has their best interests at heart. He said, “Clearly there are dangerous times ahead, but we must not give in to intimidation lest we lose our liberties and become slaves in our own land. “I cannot end this broadcast without extending my gratitude to the people of Constituency III who, in the face of brazen provocation by the police and the APC thugs, remained calm and law abiding. “Your patience has thoroughly exposed the true enemies of Rivers State and by the grace of God, we will defeat them in 2019 for as long as we remain resolute in our determination to defend our rights to be free,” he added.